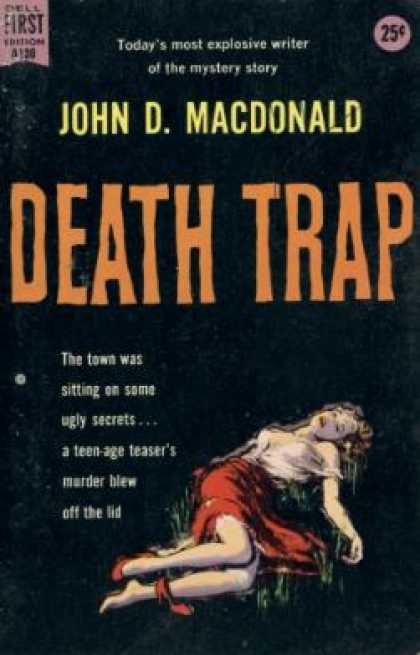 The story of John D MacDonald's beginnings as a writer was often told during his lifetime, so much so that it became the stuff of literary legend. While stationed in Asia during the second world war, he wrote a story to entertain his wife, because censorship of his letters home robbed them of anything interesting to say. 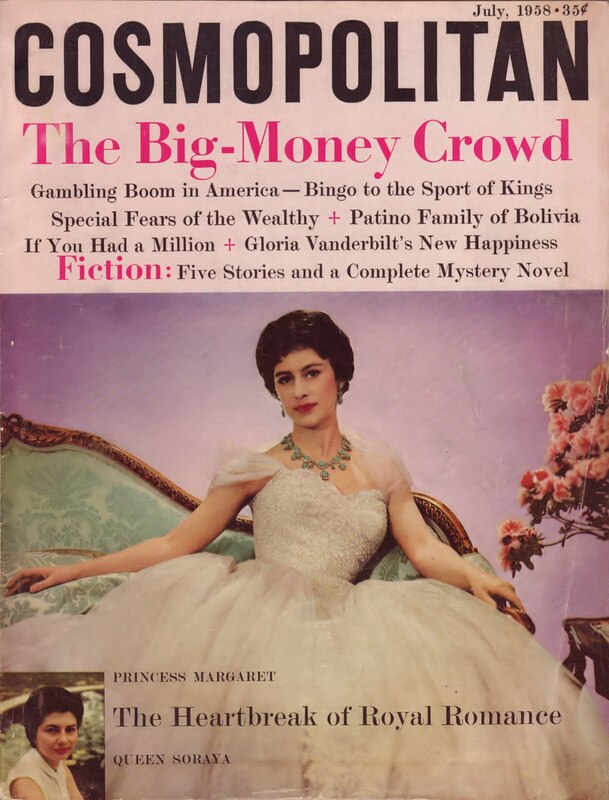 Without telling him, Dorothy MacDonald typed it into manuscript form and submitted it to Story magazine, a popular pulp of the era, who purchased it for publication and paid the author $25 for the honor of doing so. 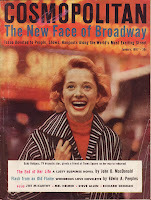 Dorothy saved the good news until her husband's return home, and MacDonald was so dumbfounded over the news that he quit the army and became an author. The facts of the story are, of course, a simplification but they are basically true. Left out of most tellings of this tale is the fact that Dorothy MacDonald's first attempt at selling "Interlude in India" met with a rejection slip. It was Esquire magazine who had the first chance to publish the first John D MacDonald story -- then still called "Through a Glass Darkly," JDM's original title -- but they turned it down, reportedly because of its meager length, not due to any lack of quality in the writing. The editors even encouraged Dorothy to submit something longer. 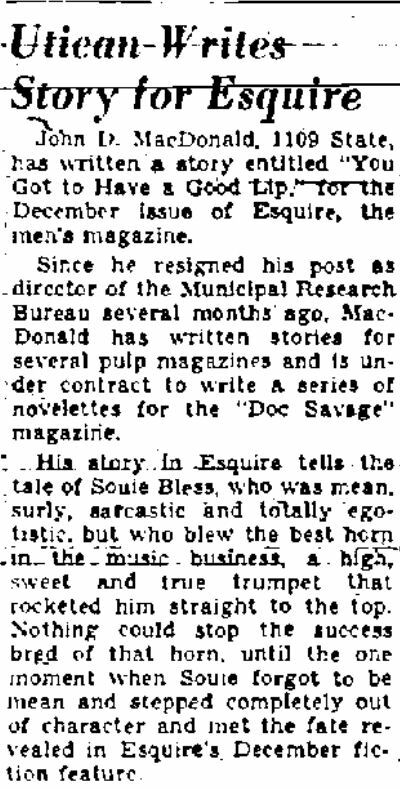 But a little over a year after MacDonald returned home Esquire managed to make up for its oversight by becoming part of another bit of JDM history: they were the first slick magazine to publish a John D MacDonald story. "You Got to Have a Good Lip" appeared in their gigantic (382 very large pages!) 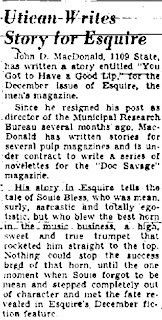 December 1946 issue and the story is a peek, I think, at the kind of writer MacDonald could have become, had 1,000 rejection slips not separated his first and his second sales. 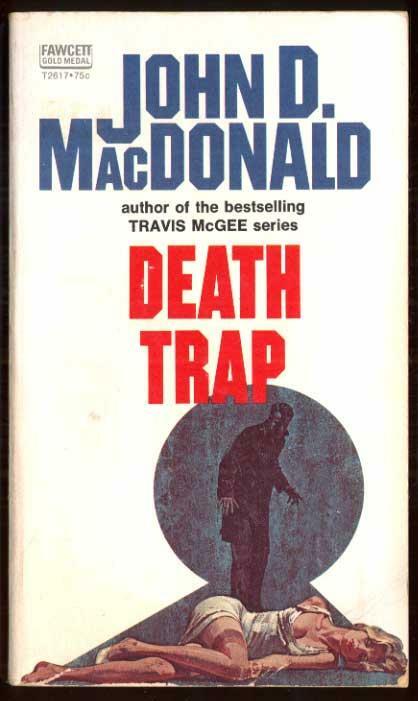 Once MacDonald decided to try writing for a living, he recalled that "for the first time in my life I really worked. Really. Eighty-hour weeks. I turned out 800,000 unsalable words in four months." Later he said "I must tell you that a lot of those words were really dreadful." What kinds of stories were these early efforts? We'll never know for certain, since the author and his young son later burned all of the manuscripts, however it is important to remember that "Interlude in India" was not a mystery story but straightforward narrative fiction dealing with the subjects of race, culture and boredom. MacDonald once sarcastically characterized his early unsellable work as "wonderful beautiful [stories] about dying blind musicians, but they didn't sell." It wasn't until he "lowered [his] sights a little" and started writing crime fiction that he finally began receiving checks back in the mail. "You Got to Have a Good Lip" is the story of a musician, but he is neither dying nor blind. His name is Souie Bless and he's "a sarcastic, egotistical jerk" who "can't think and... never smiles." But he can play jazz. "He had one fine talent that kept him in Packard roadsters and big blonde dollies. He could blow a horn -- or a trumpet if you're one of those people who call them that -- that was high, wild, sweet and true." "I had heard a few guys mention his name when he was playing out in the tank towns. I listen for things like that. I noticed that they said it with a kind of reverence. That, I didn't get... So when Hoggarty, who is the Ronald West of Ronald West's Band, caught his first horn with his babe, there was a vacant spot in the band. They filled in with a couple of plumbers and I took a trip looking for this Souie Bless. I found him in a mixed joint in Buffalo..."
When he finally gets to hear him play, Marty is impressed. "He didn't mess with rough riffs or fancy breaks. Just nice plain round notes that kind of melted out of the bell of that horn." Souie, "a swarthy guy with little black eyes," is unimpressed with the applause that "tore the roof off the place," puts his horn down and heads for the bar, "a mean look on his nasty little face." When Marty introduces himself Souie responds with bile and the two almost come to blows. But finally Marty is able to communicate his reason for being there and eventually gets Souie's agreement to quit his current combo and join up with Ronald West's Band. When Marty explains how much of a great opportunity this will be, Souie responds, "Opportunity for me... hell! West'll be buying the best horn in the business." Souie joined the new band, and it should have been the end of Marty's involvement with him, only "somehow, by going out and getting him, I had given everybody who got browned off at him a ticket to cry on my shoulder." Souie headed straight to the top and became the featured soloist in the band, performing on radio and "cutting discs by the bushel." Marty recalls that no matter how famous Souie became, he was still the "little stinker" he had always been, hated by any and everyone who worked with him, an enmity that was reciprocated toward all. He tells a story about a run-in with a trombone player over a solo that results in an "accident" involving the other musician's instrument. Then there was the fight with Big Bronson, one of the best men on drums in town. Despite Souie's smaller size he manages to chop Bronson's face into "hamburger meat" thanks to a deftly-wielded signet ring. And of course there were the girls, "big blonde women who stared at him with that honest sincere affection with which big blonde women always stare at big bank notes." Souie just "enjoyed blowing that horn and he enjoyed being a big shot." For early JDM, "You Got to Have a Good Lip" isn't bad, and the author's attempts at a kind of stylized idiom full of colorful slang spoken by earthy characters works more often than it doesn't. 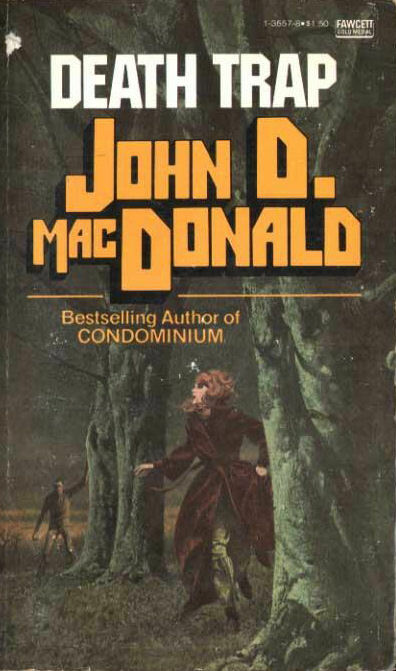 It was rare for MacDonald to have a first-person narrator tell an entire story using this kind of language, and as his career progressed it was a task that eventually fell to secondary characters. The author usually used it for comic effect, reaching its apogee in his 1949 mainstream story "Looie Follows Me." These kinds of tales featuring musicians, second-rate actors, gangsters and other assorted low-lifes populated the fiction pages of certain magazines in the 1940's, and none of them were mystery pulps. Pulp magazines demanded action, violence and real crime before anything else. Slicks like Esquire preferred a bit of distance from its subject matter, lives to be looked into and marveled at and to feel superior to. 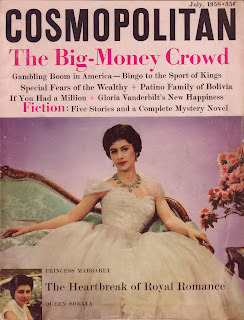 These walls eventually broke down in the 1950's as fiction became less important to the slick magazines, but there has always been a dichotomy in the world of fiction between the "serious" writers and the "popular" ones. 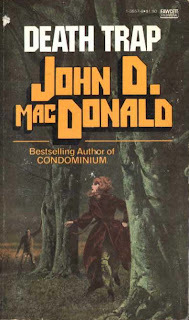 I think MacDonald longed to be a serious writer despite protestations to the contrary, at least early in his writing career, and he never stopped producing mainstream fiction. His readers can be thankful that the editors of all of the slick magazines to which he submitted work to in late 1945 didn't think he was good enough to join the ranks of the serious boys and girls. MacDonald loved music and he especially loved jazz. He owned a large collection of recordings, enjoyed visiting intimate clubs where jazz was performed, and wrote about it with some frequency. One of his Clinton Courier columns (April 29, 1947) was entirely devoted to a review of a local jazz concert (he panned it). One of his club visits was a celebration of his return from the war, when he and Dorothy headed down to NYC to see Billie Holiday, backed by Big Syd Catlett's combo, perform at the Three Deuces on 52nd Street. (Catlett was a drummer and one naturally wonders if he was the model for Big Bronson in "You Got to Have a Good Lip.") Hugh Merrill in his biography of MacDonald tells the amusing story of that evening, when during an intermission JDM and Dorothy made a trip to the rest rooms. Along the way they encountered three enlisted men in uniform fighting. Holiday pulled Dorothy into her nearby dressing room, where she enjoyed the protection of two boxer dogs. John, who had just quit the service holding the rank of lieutenant colonel, attempted to break up the row. Unfortunately he was not in uniform and one of the soldiers slugged him, knocking him five steps backward. MacDonald recalled, "I will never forget my shock at looking down at my clothes and finding out I was a civilian any damn soldier could clobber at will." It is interesting to note that, despite the purported objection to the length of "Interlude in India," "You Got to Have a Good Lip" -- at 1,550 words -- is only 50 words longer than the former short story. 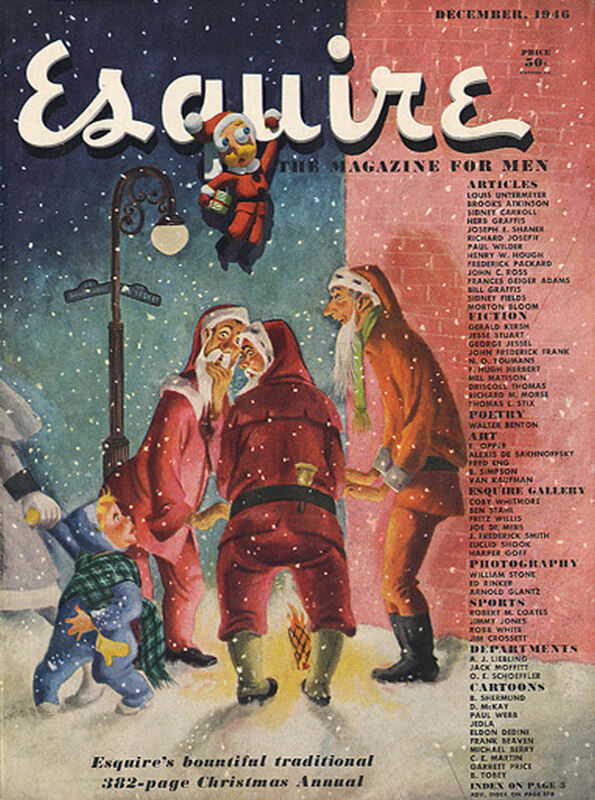 Esquire didn't even include "Good Lip" in the "Fiction" section of the December issue's table of contents, relegating it to a category titled "Briefs," which included works of both fiction and non-fiction. Would another 50 words have made "Interlude in India" both MacDonald's first story sold and his first mainstream sale? "You Got to Have a Good Lip" has never been anthologized or republished. Paul Greengrass Pushes Back 'Memphis'; So Is Travis McGee Novel His Next Film? "I brought poems of my own to class but back in my dorm room was my dirty little secret: the half completed manuscript of a novel about a teenage gang's plan to start a race riot... This novel, Sword in the Darkness, seemed very tawdry to me when compared to what my fellow students were trying to achieve, which is why, I suppose, I never brought any of it to class for a critique. The fact that it was better and somewhat truer than all my poems about sexual yearnings and post-adolescent angst only made things worse. The result was a four-month period in which I could write almost nothing at all. What I did instead was drink beer, smoke Pall Malls, read John D. MacDonald paperbacks, and watch afternoon soap operas." 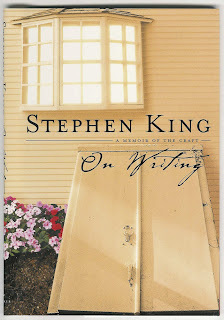 -- from On Writing: A Memoir of the Craft (2000) by Stephen King. MacDonald, of course, went on to write the Introduction to King's first short story collection Night Shift, and the two eventually became friends. When the United States entered the Second World War in December 1941 John D MacDonald was already a member of the armed forces. He had joined the Army in June of 1940 in an act of near desperation, having failed in several attempts at a career in the financial industry. With a recent Harvard MBA on his resume, he managed to snag a position as an ordinance officer and was stationed in a variety of locations in upstate New York before being sent overseas in 1943 to serve in the China-Burma-India (CBI) theater of war. He remained there until the war's end in 1945, having been stationed in both India and Ceylon (Sri Lanka). So it is no surprise that once MacDonald began his writing career in 1946 much of the early work he produced drew heavily on his war experiences. And although he never saw any real action -- he worked in procurement and supply-- he had obviously seen enough and remembered enough to use many of the things he has witnessed in his fiction. MacDonald produced a glut of war-related stories in the very early years of his writing career, so much so that he had to eventually be dissuaded by one of his pulp magazine editors. Stories with titles such as "Blame Those Who Die," "The Flying Elephants," "Muddy Gun," "Justice in the Sun" and "The Chinese Pit" filled the pages of long forgotten pulp magazines such as Best Stories, Doc Savage and Short Stories. But he never really stopped writing about people who had served in the war, about how the conflict had shaped them, the massive waste on a nearly unimaginable scale, and -- especially -- the bonds of friendship and enmity that were forged when young men were separated by thousands of miles from their homes and living in a strange land. Some died, some merely survived, others were made better for their time overseas, and some made out like bandits. In the early spring of 1958 MacDonald must have been reliving his war days, for he produced at least two memorable works that drew upon his experiences in the conflict. His novella titled "Taint of the Tiger" appeared in the March issue of Cosmopolitan, and was later expanded and published as a paperback original called Soft Touch. It's the story of two war buddies who are reunited after the war and attempt to pull off a grand heist. They met serving in "Detachment 404" of the OSS, precisely the same unit the author was assigned to, and while these two characters were behind-the-lines combat veterans, their past experiences were clearly drawn from MacDonald's own. Four months after "Taint of the Tiger" was published, another MacDonald work appeared in the pages of Cosmopolitan. 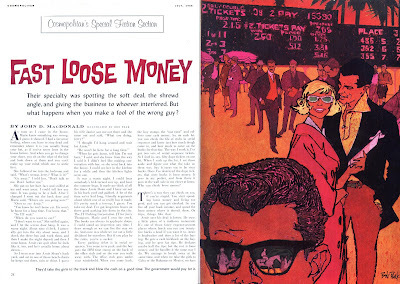 The July issue featured his short story "Fast Loose Money," a tale that again featured two old war buddies who had served in the CBI, but this time their experience drew directly on MacDonald's. Jerry Thompson and Arnie Sloan spent the war serving in C Company of the 8612th Quartermaster Battalion stationed thirty-five miles north of Calcutta, and they used their decidedly non-combat war time to make the most of a bad situation. It is a behavior that has carried over into their post-war lives in the States: as Jerry puts it to the reader, "... if you play by the rules, you're a sucker." The pair met when Arnie Sloan was transferred to the QM Battalion, where Jerry was already stationed as a sergeant. Life in the railway junction of Deladun was hot, monotonous and ripe for picking. "We had warehouses there and plenty of six-ton trucks, and it was a soft deal. Go load stuff off the Calcutta docks, check it in, warehouse it, then either ship it north by rail, or run priority items by truck to Dum Dum Airfield for air transportation or turn it over to a QM truck company." At first Jerry eyes the newcomer Arnie warily, as he "had a lot of things going on the side" and he kept his guard up in case Arnie was an "I.G. plant." But after a while they recognize each other as birds of a feather and become friends and partners in the art of skimming. "We were both hungry, and for hungry guys that station was paradise." Their enterprises were aided by the fact that C Company was headed by an indifferent leader, a South Carolinian named Lucius Lee Brevard. Captain Brevard "just plain didn't give a damn, and neither did his lieutenants. The officers kept themselves stoned and ran down to Calcutta to the big officers' club almost every night." Jerry recalls many of the crooked deals he and Arnie undertook in their quest to acquire personal wealth, including everything from PX watches, to stolen liquor, to a complicated scam involving exchanged missionary bonds. When the money got too big for those small-time swindles, they devised a way to melt gold into airplane parts and fly them over the hump to China for exchange. "You could make 10 percent on your money every trip." At first the pair sent their profits home via "those hundred-dollar money orders you could get." But when their earnings became too great they had to devise alternate methods. After Captain Brevard crashed his jeep on the way back from Calcutta one evening, a new leader is assigned to C Company. Captain Richard E. Driscoll is everything Brevard is not, and it spells immediate trouble for Jerry and Arnie's money machine. "He was a little blonde guy with long eyelashes, chilly blue eyes and a way of holding himself very erect. He did absolutely nothing for three days. Just when we were beginning to relax, he made his move. He conducted an official inspection without warning. Then he called a company formation. It had been so long since anything like that, the boys felt they were being imposed upon." Jerry describes Driscoll's first address to the unit as "G.I. chicken, right out of the book." "All officers and enlisted personnel are restricted to the company area until further notice... No vehicle will leave the motor pool without a proper trip ticket countersigned by me. All personnel will wear the uniform. There will be a complete showdown inspection tomorrow morning at nine. All non-coms in the three top grades will assemble at the orderly room in ten minutes. Dismissed!" After a week under Driscoll's command Jerry and Arnie's income is severely affected. They get together and, along with a few of Brevard's leftover slacker officers, devise a plan to slowly drive Driscoll out. "Arnie summarized it. 'Okay, guys. Get the word around. Whatever you do, you do slow. Whatever can be dropped, you drop it. And follow every order right to the letter. The stuff everybody has been doing as routine, you don't do it unless you're ordered to do it.'" And within two weeks the company "went to hell." Simple tasks never got done, or if they did they were done poorly. Driscoll soon recognized what was happening but couldn't respond with discipline because no one had done anything technically wrong. Instead of relaxing his grip, Driscoll was "too stubborn to quit" and he tried to be everywhere at once. With no one on his staff he could actually trust, the task of running the company "peeled the weight off of him" and the battalion brass "was on his neck every minute." After a mere seven weeks of this Driscoll was relieved of command. It only took a week to "break in" his replacement, and by then the boys were back in business. Once back home the boys use their money to go into business, but in separate enterprises. Arnie now owns a fancy restaurant and Jerry operates three downtown parking lots. Both are married, have remained friends and live next door to each other. And both have continued their "off-the-books" way of life, Arnie by cash kickbacks from suppliers and large, undeclared tips, and Jerry by rigging the time stamp machines at his lots. They are careful about spending too much of their illegal profits and keep much of it in cash, hidden in safes inside their homes. 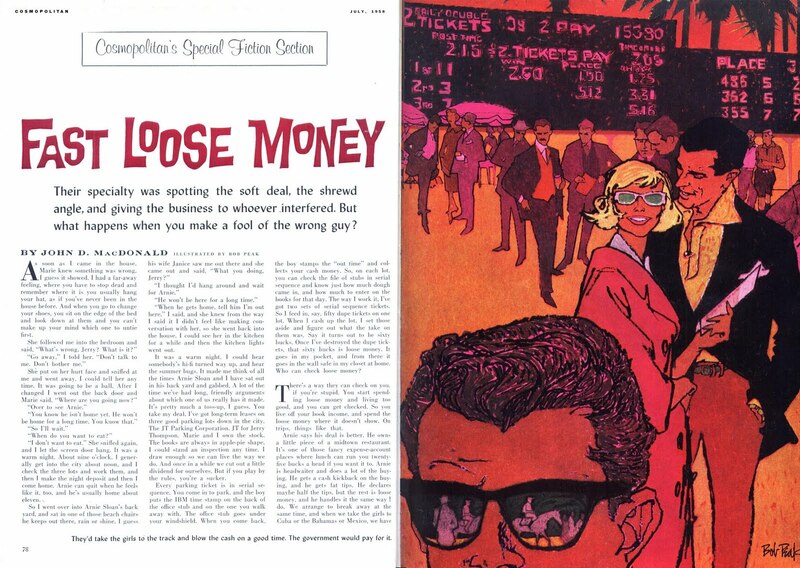 Stripped of its background and setting, the plot for "Fast Loose Money" is as old as O. Henry. 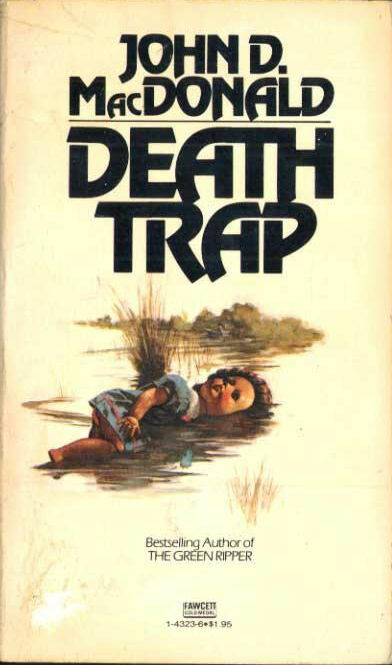 The ending is fairly predictable and is prefigured in the opening of the story. 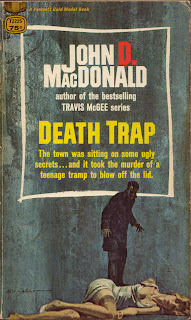 But MacDonald's background, his character construction and the structure he uses to tell the tale are really terrific. From the opening interaction between Jerry and his wife, to his recollections of times past, MacDonald keeps the narrative going a breakneck speed. At only 3,000 words MacDonald creates several real and recognizable worlds, where the reader can almost feel the tropical Indian heat and smell the backyard cigar smoke. It is one of JDM's better short stories, a fact he himself recognized by including it in his first "mainstream" anthology, End of the Tiger and Other Stories. 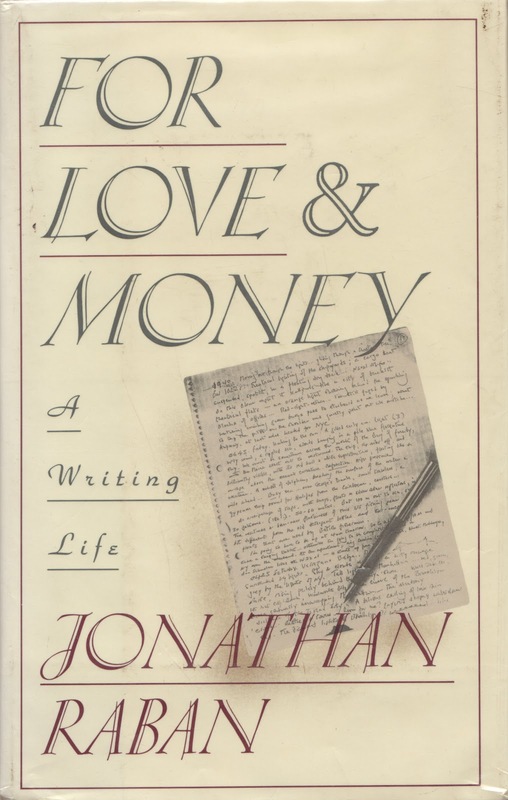 Just exactly how autobiographical "Fast Loose Money" is cannot be known. Company C is clearly modeled on the unit MacDonald was originally assigned to once he arrived in the CBI, before being reassigned to the O.S.S. in Ceylon. I've always wondered if the character of Captain Richard E. Driscoll was based on the author himself. His rank was the same as MacDonald's when he arrived in India, he was blonde and blue-eyed like MacDonald, but his height and demeanor are polar opposites to the author's. Although he is hardly a sympathetic character, Driscoll was only trying to straighten out a bad situation, much as MacDonald may have tried to do. One can certainly imagine a young captain arriving in a theater of war, heading up his first command and trying his best to run things the right way, even if it really was nothing but "G.I. chicken." And there were people like Jerry and Arnie in every unit of the war, especially in areas where combat was but a faint sound in the distance. The bit about the hundred dollar money orders was clearly drawn from MacDonald's own experience. He won a large sum of cash in a "very fortunate session at the poker table with some people heavy with flight pay" and sent it home in "a little sheaf of hundred-dollar money orders." The funds were used to purchase the MacDonald's summer camp on Lake Piseco in upstate New York. And the attentive reader really has to wonder about that bit with the jewels-hidden-in-wax-in-the-canteen bit. How autobiographical was that? It was easily the most oft-used method of secretly moving ill-gotten riches in the JDM oeuvre, appearing in many different places, including the early stories "The Flying Elephants" and "Sepulchre of the Living," the first Travis McGee novel The Deep Blue Good-By, and a couple of other tales I can't recall to mind right now. Did MacDonald bring anything back to the states that way? Copies of End of the Tiger and Other Stories are relatively easy to find on eBay or Amazon. 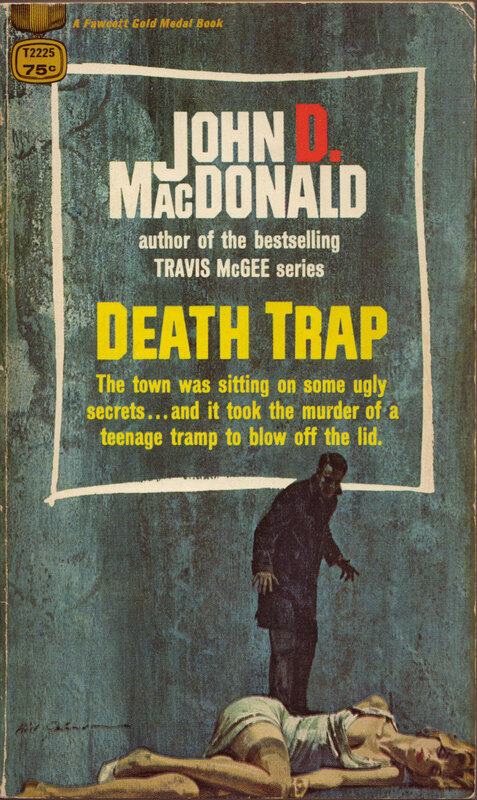 MacDonald changed the name of the story slightly ("The Fast Loose Money") for the anthology. 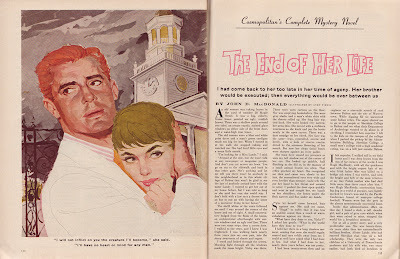 A special thanks to Leif Peng of Today's Inspiration for the scans of the original Cosmopolitan story art, illustrated by the great Bob Peak. "5 Reasons We Love Dana Delany" from tvguide.com. 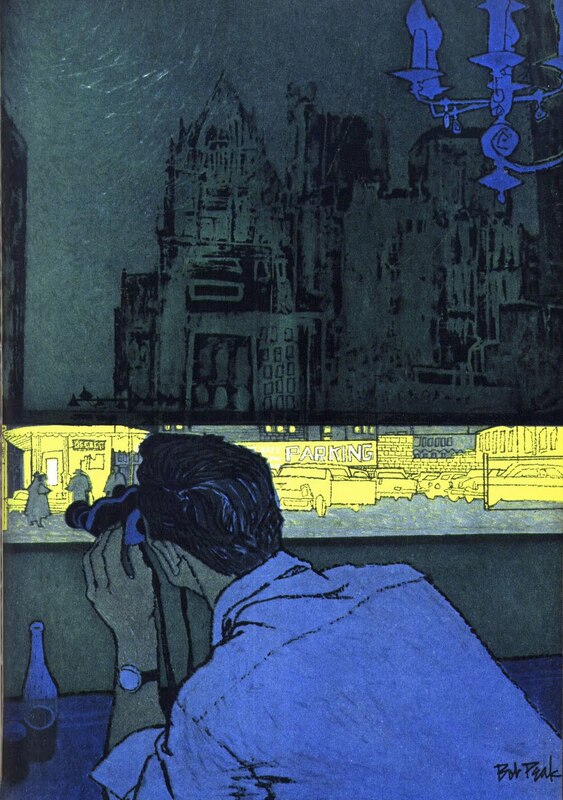 "I never met [Dashiell] Hammett and never corresponded with him. Here are some small and unimportant ways in which our lives touched. Hammett and I were both discharged from the Army in September of 1945 at Fort Dix, NJ. I was 29 and he was 51. "His first novel, Red Harvest, was published in 1929 when he was 33. My first novel, The Brass Cupcake, was published in 1950 when I was 34. Both novels are still in print. "His last short story in the pulp magazine Black Mask was "Death and Company," published in 1930. 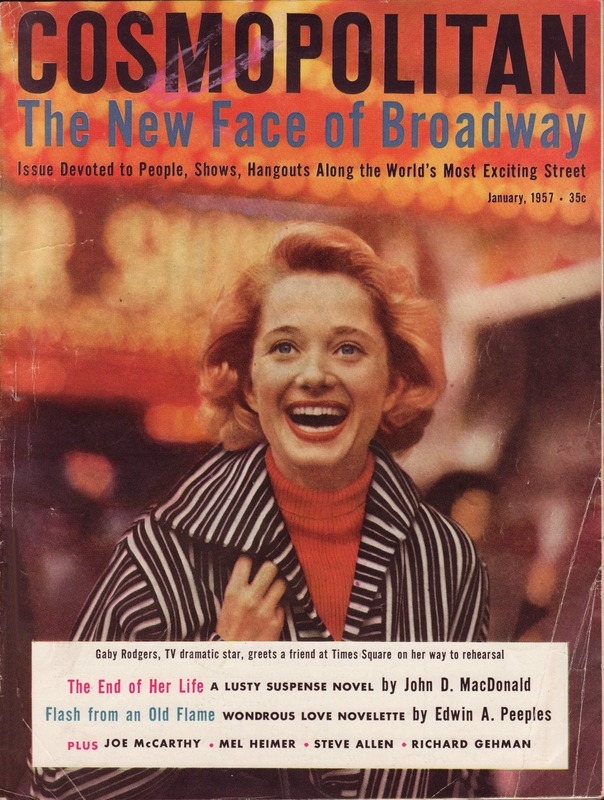 Seventeen years later, my first story in that magazine was titled "Manhattan Horse Opera," which doubtless shows a smidgen or two of the Hammett influence. 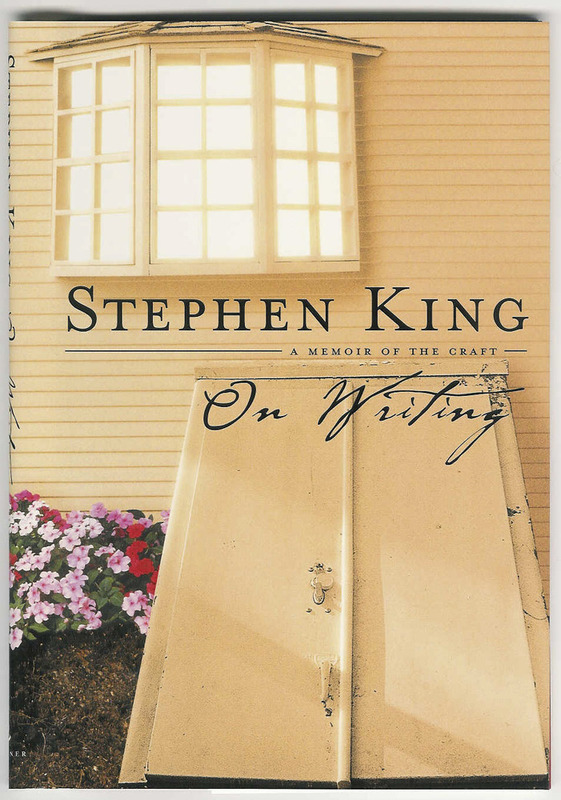 He influenced us all: The straight, simple prose style. Everything deleted except what moved the action forward. Characters shown through action and through dialogue -- with a special emphasis on making the dialogue ring true. This is a very chancy area. You cannot have people talking the way people actually talk. Transcribe a tape of any casual conversation, and you will see what I mean. You have to do dialogue that, if spoken exactly as written, would sound just a little bit stilted -- yet on the page, it creates for the reader the imitation of a total reality." -- from John D MacDonald's book review of Shadow Man (a Hammett biography) published in the August 2, 1981 edition of the Washington Star. "A curious matter I'd like to call to your attention -- although you have probably been all through it with yourself -- is your dialogue. Nothing could be more natural and easy and to the point on paper, and yet it doesn't quite play. We tried it out [while writing the screenplay for Double Indemnity] by having a couple of actors do a scene right out of the book. It had a sort of remote effect that I was at a loss to understand. It came to me then that the effect of your written dialogue is only partly sound and sense. The rest of the effect is the appearance on the page. These unevenly shaped hunks of quick-moving speech hit the eye with a sort of explosive effect. You read the stuff in batches, not in individual speech and counterspeech. On the screen this is all lost, and the essential mildness of the phrasing shows up as lacking in sharpness. They tell me that is the difference between photographic dialogue and written dialogue. For the screen everything has to be sharpened and pointed and wherever possible elided." "'Look --' [MacDonald] pointed out through the mosquito screen across his own front yard. 'The neighbors. Now the guy over there, beyond those trees, he's a minister of the church. Right now he's under indictment for selling eight million dollars' worth of phony tax havens. Then there's another guy, just there; he's a qualified physician. He's never practiced, so far as I know. He keeps a Rolls-Royce in his driveway -- never cleans it. I don't know what he does. But every two weeks or so I hear his power boat going our to sea at three in the morning. Maybe an hour later, it comes back. That's what he does. I don't think I exaggerate too much in the books.'" 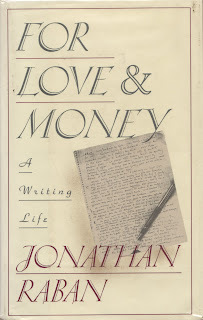 Jonathan Raban, describing his visit with John D MacDonald in his 1987 collection of essays For Love & Money: A Writing Life.